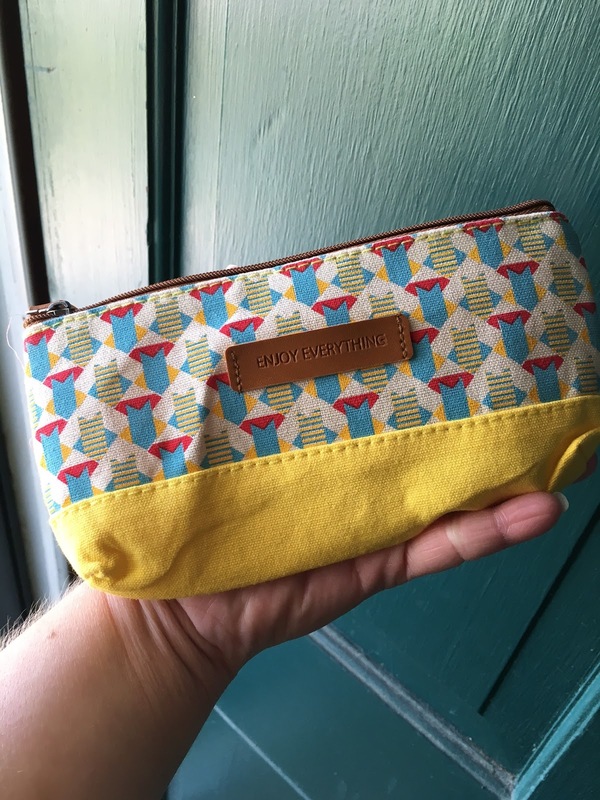 I was reading one of my favorite lifestyle blogs, Pocketful of Joules, recently and she reviewed a reallyyyy cute lifestyle subscription box called Peaches and Petals. I'd never heard of the box, but I was so impressed with what Joules received in hers in February, that I had to give it a try. It didn't hurt that she also had a 50% off code for a first box. SOLD! 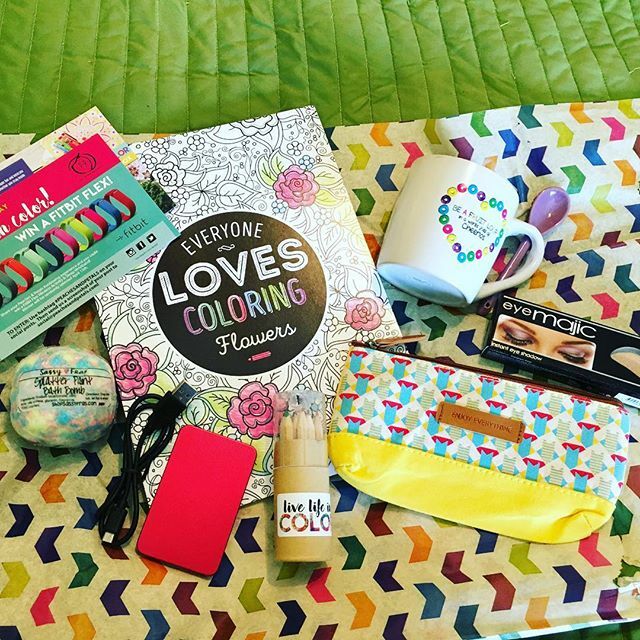 So here's my March box with the theme "Live in Color!" Since this is a lifestyle box, there are endless possibilities for what you might receive. The company guarantees you'll receive 3-6 items with extras thrown in from time to time in the lifestyle, fashion, and beauty categories. Let's take a look at the individual items in the box. I love a mug, so the first item I grabbed out of the box is this "Be a Fruit Loop in a world full of Cheerios" one with a ceramic spoon built into the handle. 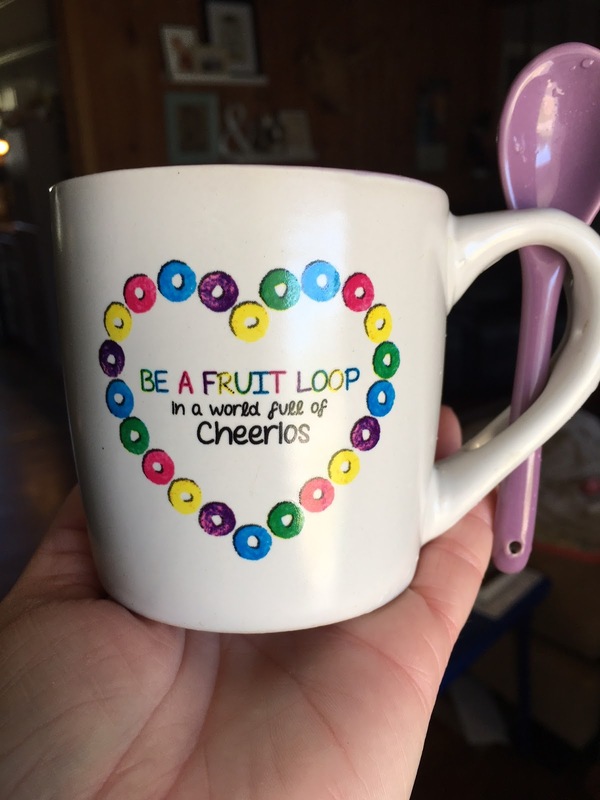 It's super cute and colorful, but it's also really small (see it compared to my hand) and the print on the mug itself is a little pixelated. I hope it doesn't rub off! We'll see how it wears after a few trips through the top rack of the dishwasher. I love bath products, so I was also really drawn to the Sassy Fras "Splatter Paint" bath bomb. It smells amazing even through the shrink wrap, and I'm looking forward to trying it out. As much as I love a gorgeous bath, I also like products like this to make Greyson's baths more fun with less bribery to get him into the tub. Everyone has a power brick but me. Not anymore! 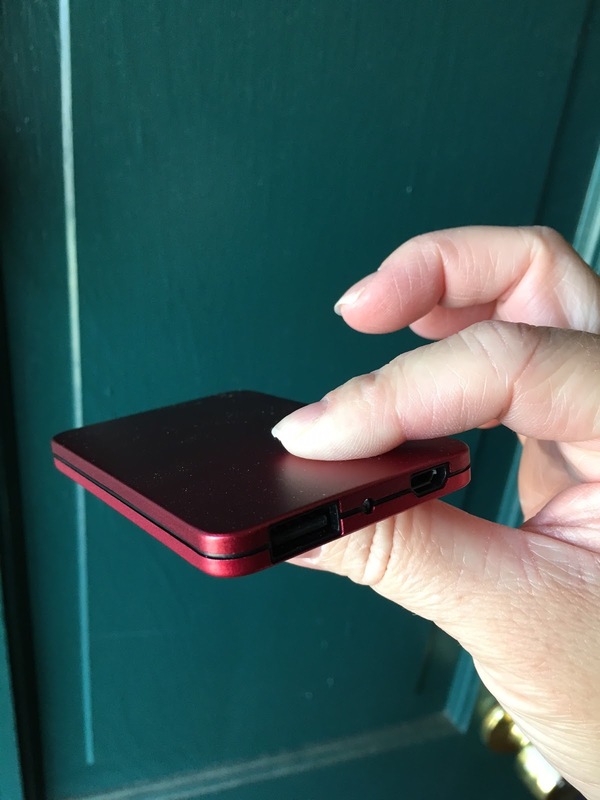 I might be the last person, but thanks to Peaches and Petals I have this really cute, red, sparkly power brick to carry in my purse. I got it all charged up and it works like a charm. It's really compact and good for a side pocket in my bag. No brand listed on this one, though. Sorry! I love cosmetics but this is perhaps one of the weirdest products I've ever received in a box. 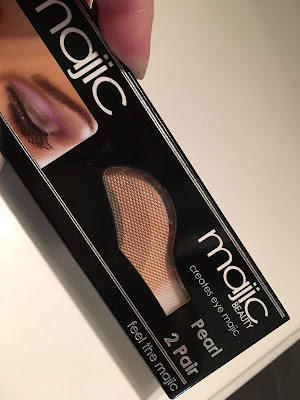 Majic Beauty is basically a sticker eyeshadow. You transfer the color to your eyelid for a multi-tonal effect, but since these don't really blend into each other (hello, stripes!) I'm a little concerned about how they'll look. I have no idea how they'll function either. We'll see! 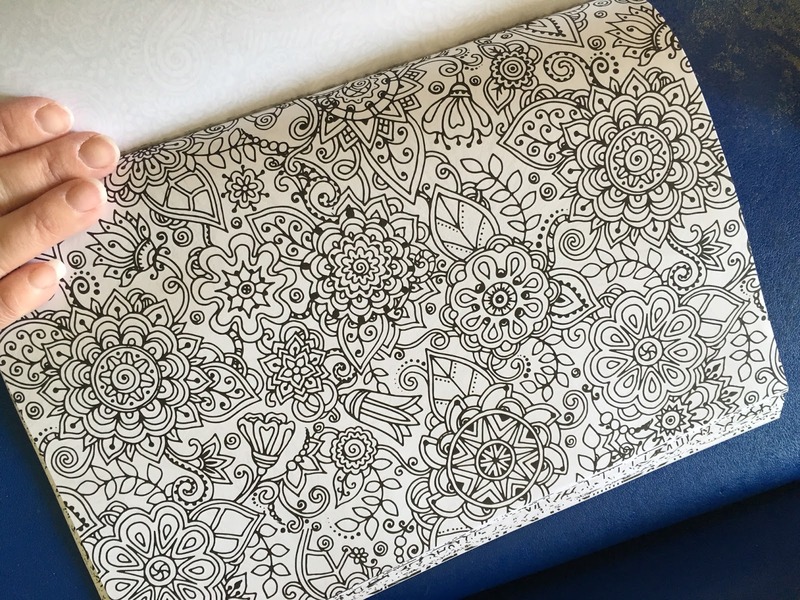 This is the Everyone Loves to Color Flowers coloring book. The pages are all fairly busy and patterned. The paper seems like a good quality, and the pages are printed on one side so you can use markers or gel pens without bleeding onto the next image. The pages are also perforated for easy removal. Overall, I really like this book. The box also came with a small set of mini colored pencils with a sharpener built into the container. I haven't taken an individual photo of it, but it's cute (pictured in the group photo above). I'm a pencil snob and prefer the color selection in a larger box, so I'll probably give these to Greyson. The last item in the box is a small, cloth makeup bag. I keep a bag like this in my purse at all times with a couple of lip products and some liquid bandage inside. This feels like thick, good quality, it is lined, and I immediately put it into my bag since these are some of my favorite colors. There were also a couple of cards in the box. One with a list of all the product descriptions, an ad for their monthly giveaway, a FitBit Flex, and a coupon for 25% off a Sassy Fras order. Overall, I thought this was a really fun box. My favorite things are the coloring book, power brick, and bath bomb. I like the bag, but it seems a fairly tame, middle-of-the-road type of item for any subscription box. I'll know more about how I feel about the mug and eyeshadow with some time and use. Peaches and Petals is a good deal at $19.99/month, and given the range of items you can receive it seems like it would always be a fun surprise. Unfortunately, I'll be cancelling my subscription for now because I'm cutting back on subscription boxes in general, but when I start back up in the future, I'd like to receive a few more of these! I know lots of us have tried cosmetic subscriptions like Birchbox and Ipsy, but have you ever tried a lifestyle-themed box? I was a Birchbox devotee for years and loved the surprise aspect of the deliveries and products, but I also decided I was spending too much on subscription boxes... and ultimately, wound up sharing most of the products with friends and family when I determined they weren't for me. This sounds much more my speed! This box does look like fun; however, my experience has been that I end up not using and/or giving away about half the stuff in any subscription box (or it just hangs around my house and takes up space), so I quit paying for them. I really like them, I just don't really need all this extra stuff. I'd rather spend the $$ on things I KNOW I like! I usually get through 3-6 months of any box before I got to that point, Tara. lol That's been the case with all the boxes I've tried. Since this one is more toward lifestyle and house type stuff, I think I'll use a higher percentage of things. From what I've seen so far, anyway. And I can't type worth a flip. *GET to that point. Okay, I love that power brick. Which is more like a brickette. Even so. 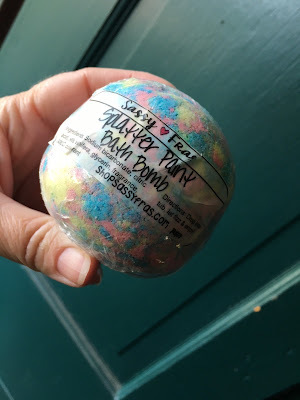 I neeeed more bath bombs. The eyeshadow sounds weird - ok, you gotta try it out and let us know! :) I like subscription boxes and have tried a few but after a while I feel like it's just the same stuff and I get overwhelmed so I've cancelled all. One of my favorites though was Freckled Fawn. So cute. I love my FabFitFun subscription. It's quarterly and always has really quality items. I've loved almost everything that has been in it so far. And the box ships free!